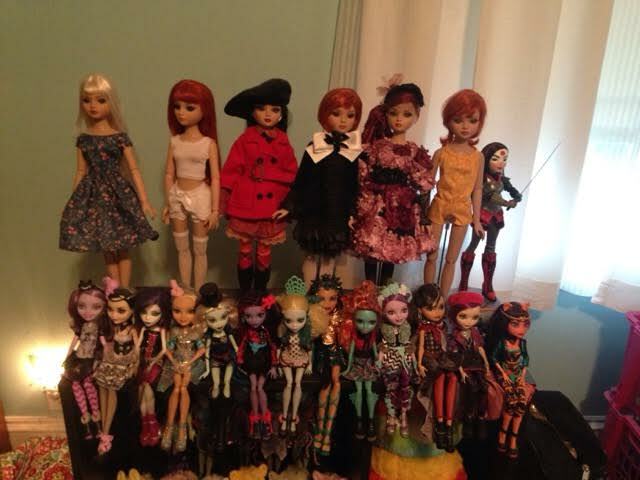 I'd love to see pictures of the rooms where you display your dolls, whether that be your bedroom, living room, or room specifically for dolls! I'm doing a little cleaning and reorganizing of displays to fit things, but once I finish I'll post pictures of my room. 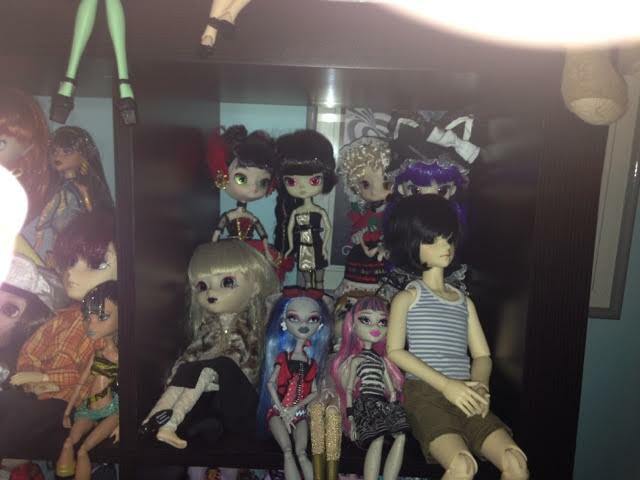 Sooo many dolls packed into such a small space, but I love coming home to it. 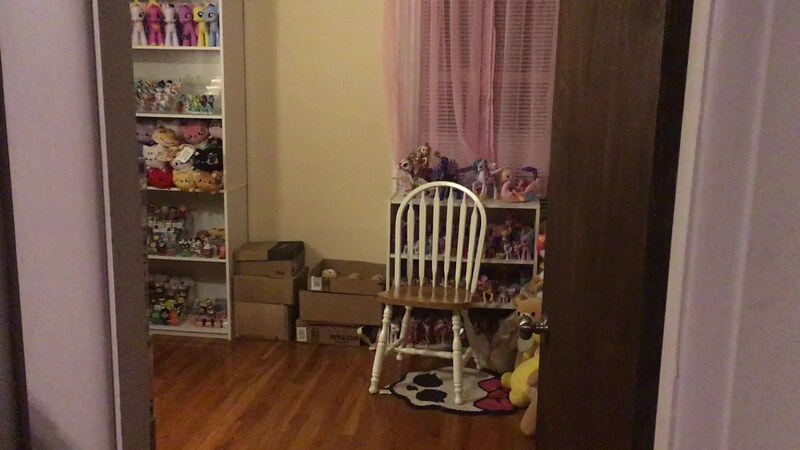 We just moved into our new place on Saturday, and I finally have a dedicated toy room again after living in a confined space with my parents for the last 6 months. It's a disaster area of boxes right now, so I have no pics for you at the moment, but once everything is set up in a week or so, I'll post some pics here and probably put a tour video on my youtube. I'll try to take some this weekend. My EAH / MH live (mostly ) on the top of the curio cabinet in the loungeroom. Except for the 10 or so lining the edge of the TV/video cabinet. Pullips are on the small display table that is supposed to display one of the chess sets I own, but I packed it up over Christmas (that's where the tree goes), and now the Pullips have taken it over. I'd love to display them properly on a dedicated shelf / cabinet, but there's no room at the moment. 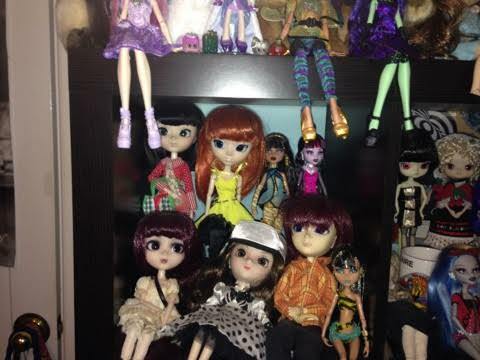 Like dxgirly, my doll room is trashed at the moment. We had water leaking into the room from beneath our sliding glass door and didn't realize it until the floorboards started to swell and warp. >_< The door has been replaced and the new flooring arrived yesterday, so we're on track to get the room put back together. 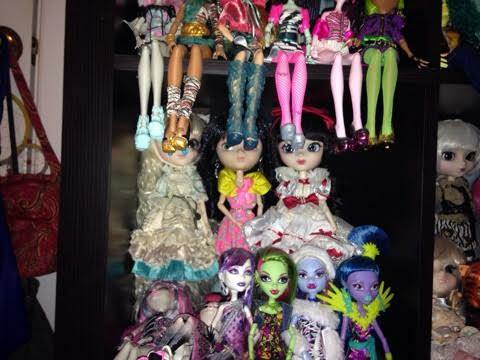 But for the time being our toys and dolls are mostly hanging out with us in our bedroom. I still need to buy one more bookcase, and it will be fully complete. If you click on the image, it will link you to a short video on flickr. Top shelf first. 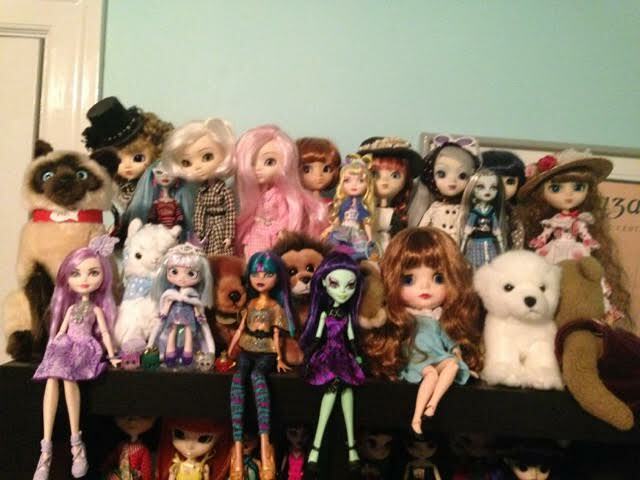 Some Pullips, couple of MH and EAH, a few obscured stuffed animals and Shoppie Gemma Stone. Second shelf. 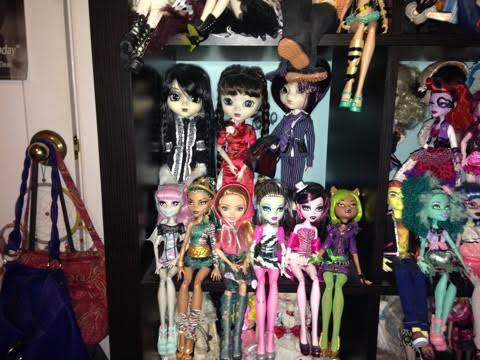 More Pullips, my custom Taeyang Ace, and a few MH. Shelf 3! 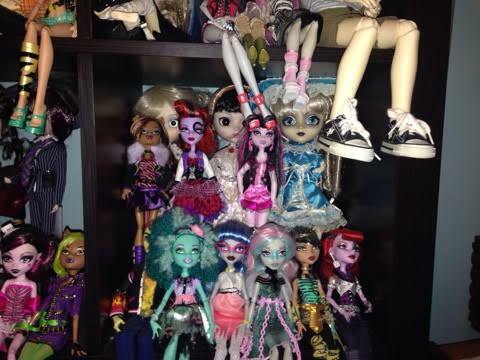 Dals hiding in back, Pullip Fourrure (Who I just realized is missing a shoe Don't worry, I found it), Ghoulia and Rochelle and my Dream of Doll, Sam. 6! Rochelle and Cupid are taking a nap and I forgot to wake them up for the picture, sorry about that. 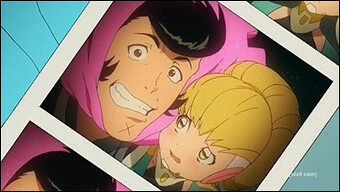 Romantic Alice, Eternia and Snow White in the back. Numero 8! 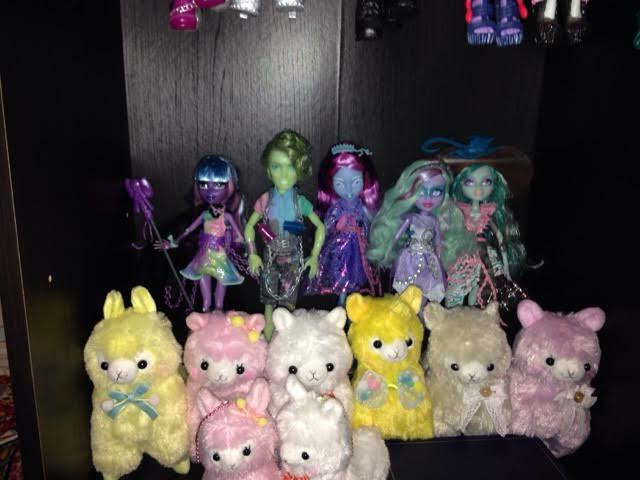 The Haunted gang and some of the Alpacasso posse. The only reason Haunted Rochelle isn't with them is simply lack of room. Number 9! 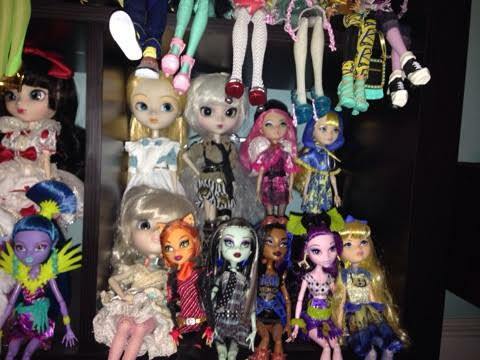 More MH and EAH, some of my Ellowyne Wildes, and SDCC Katana. I put Katana there because it was the only empty space I had at the moment, and it looks like she's about to chop Ellowyne in half, which I think is hilarious, so there she stays. Last one, I promise, number 10! 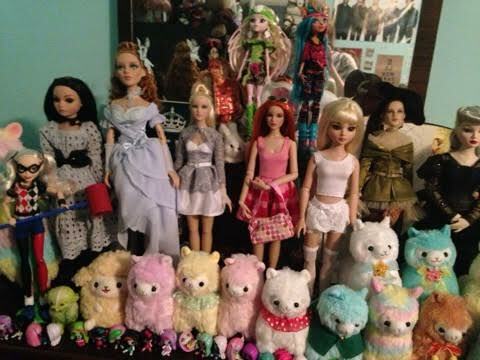 Some Tonners (From left, starting with tallest doll: Blue Butterfly Glinda, New York Night Cami, Summer Swing Cami, Wizard of Oz 'Beauty and Brains'), Batsy and Isi chillin' up top, minis and some more of the Alpacasso posse, and DC Super Hero girls Harley Quinn.